The row of storefronts flanking the old Ghim Moh Market had, for months, stirred only a passing interest as I was whisked along by my mother to complete our morning shopping. Earlier this year, though, I decided to let my feet guide me to this little nook one lazy afternoon. 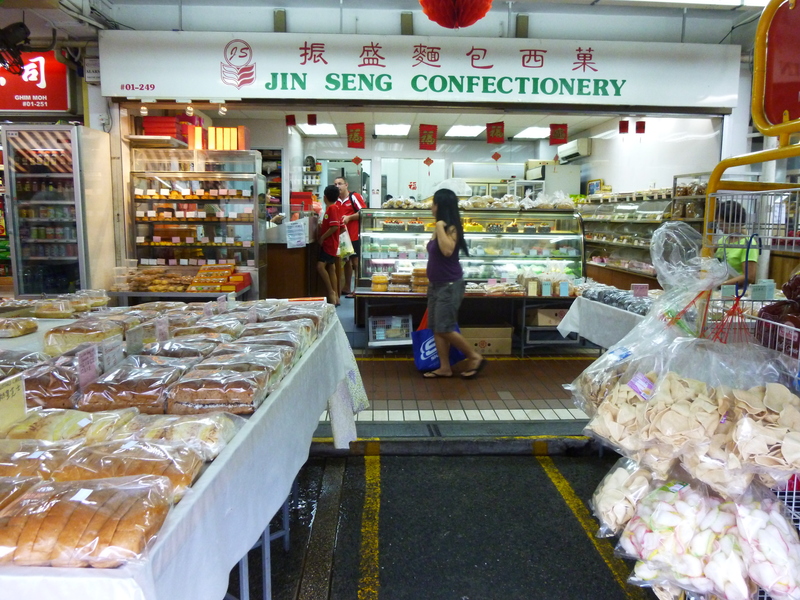 Jin Seng Confectionery is one of the few remaining bakeries left in Singapore that still sell some varieties of old-school local pastries which have long disappeared from the shelves of most. The diversity of goods on sale surprised me–ranging from loaves filled with custard and classic favourites like cream puffs, sausage rolls and blackforest cake, to Swiss rolls and mounds of marble and chiffon cake and others I’d never seen before like the curiously-named ‘wife’ and ‘husband’ buns. 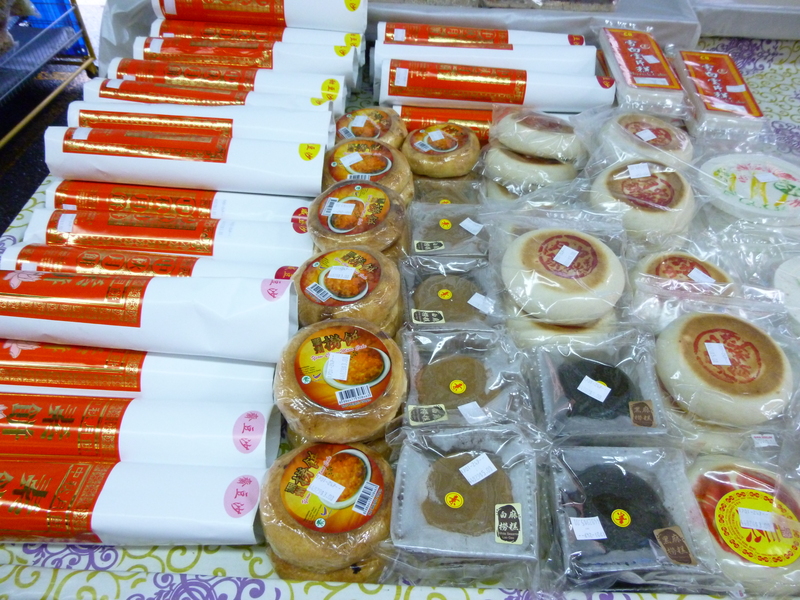 Since the Mid-Autumn Festival was approaching at the time they also displayed a selection of special treats. Mooncakes, both the classic varieties with a thick crust filled with red bean and lotus paste, as well as the smaller snowskin varieties coming in flavours such as coffee and black sesame and durian, were proudly arranged at the front of the store. 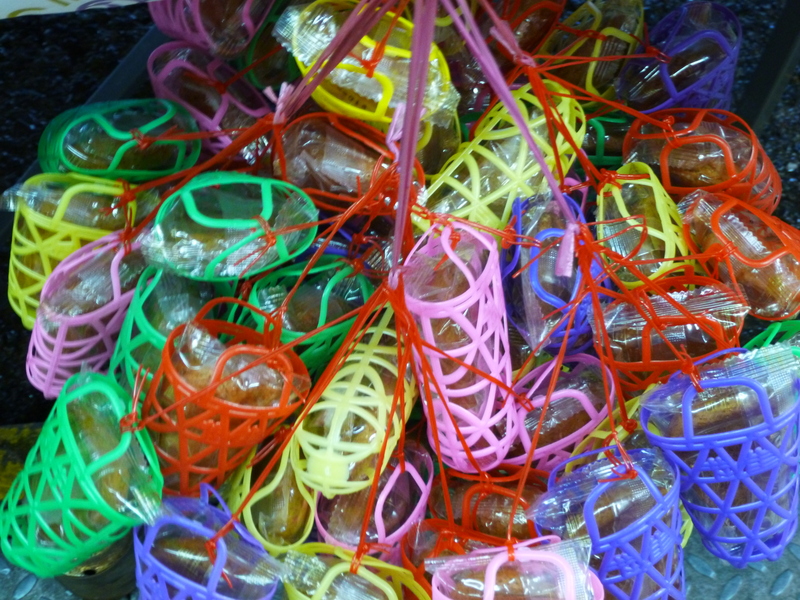 Facing them was a table laden with more traditional variations on the Mid-Autumn Festival delicacy: crispy-skinned red bean mooncakes packaged in long paper tubes, disc-shaped Teochew mooncakes with a diameter twice the width of my face; colourful plastic baskets bristling with miniature piglets and carp fashioned of brown dough. I was introduced to each of them in turn by a lady shop assistant who had seen me approach the shop. I proceeded to the back of the shop, where the boss himself could be seen working away in the kitchen with his wife. When I motioned to them to ask if I could take a picture, I was led into the kitchen to meet the folks behind the establishment. 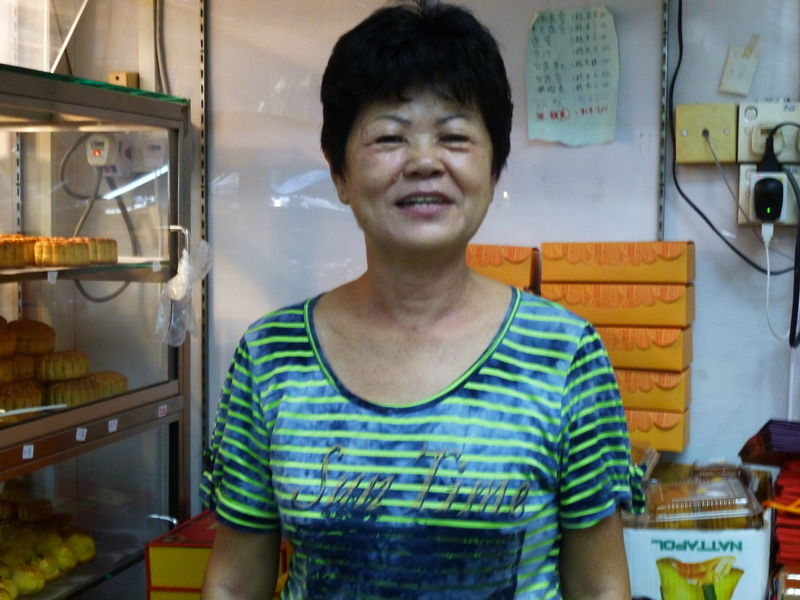 The lady boss leaned in close and, with a twinkle of her eye, began in Mandarin to let me in on the background of their business. 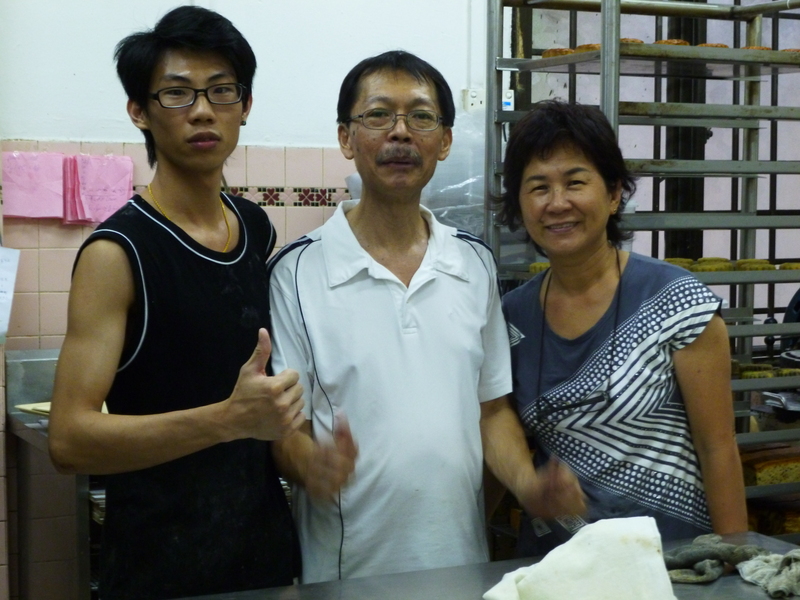 I do hope that, as Mdm Dai said, Jin Seng Confectionery will continue to ‘dong‘ and continue being a bastion of traditional baking in Singapore. Without any upgrades or publicity they might, unfortunately, be swept away by the tides of time. Even if that happens, I hope their determination and warm spirit can persevere in the hearts of others like them, out there. 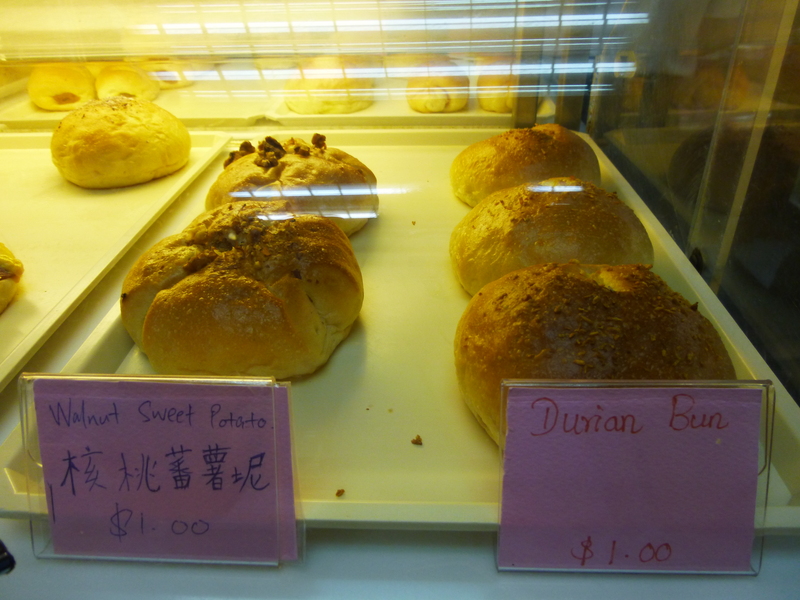 Some of the bakery’s Mid-Autumn offers. A bushel of little piggies.